CMN Hospital’s NJ 4th Annual Miracle Summit! 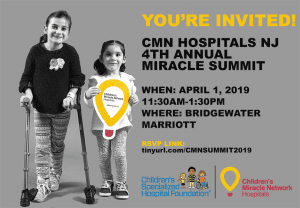 The CMN Hospitals NJ Team will be hosting our 4th Annual Miracle Summit on April 1st! This is a very special day of the year! Our local CMN Hospitals partners and programs, are invited to come together under one roof to celebrate Children’s Specialized Hospital and 2018 successes! This year, we have some exciting additions to our lunch program. We will be joined by Ali Stroker, a former Children’s Specialized Hospital patient, who is fulfilling her acting dreams on Broadway and the first actress to use a wheelchair for mobility on stage. There will be many other special guests joining us, along with the announcement of our 2019 Champion…you won’t want to miss out! We are looking forward to a day of inspiration, celebration, and making miracles! If you want to join the fun, click here to RSVP today!